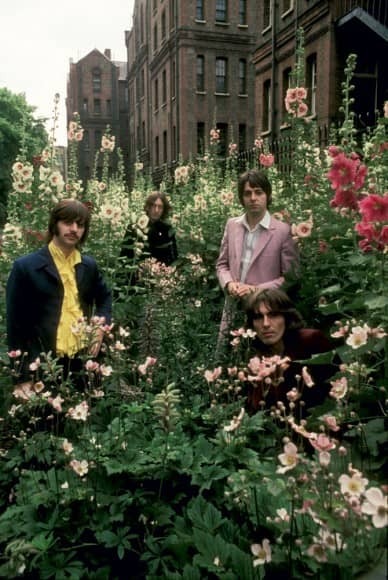 Although best known as a war photographer, in the early summer of 1968 Don McCullin was telephoned by Paul McCartney with an irresistible assignment: to photograph The Beatles in a variety of locations across London, to provide publicity shots and a cover image for Life magazine. One day in 1968 I got a phone call, which I thought was just a joke. An unfamiliar voice said he was phoning from Apple and wondered if I would consider spending a day photographing The Beatles for a fee of two hundred pounds. They were a little tired of approaches from photographers and wanted to get a fresh supply of pictures. They would return the negatives and I would keep the copyright. At the time, The Beatles were in the midst of recording The White Album, and the photography session promised brief respite from the often strained atmosphere inside the studio. The event became known as the Mad Day Out, and saw the group visit seven different locations where hundreds of stills were taken. 28 July 1968 was the date of the Mad Day Out. Also joining the party were five others with camera – Ronald Fitzgibbon, Stephen Goldblatt, Tom Murray, Tony Bramwell and Mal Evans – plus John Lennon's girlfriend Yoko Ono; McCartney's girlfriend Francie Schwartz; and Evans' six-year-old son Gary. A Day In The Life Of The Beatles is an anthology of McCullin's photographs from the Mad Day Out. Although several of the images have assumed iconic status in the intervening years, many are previously unpublished. The pick of the day's photographs are presented here in non-chronological order, in a mixture of black-and-white and colour. In July 1968, The Beatles were still at the peak of their fame, and McCullin was given a unique opportunity to capture the group in public in a series of uncharacteristically relaxed situations. They are pictured alongside a seemingly oblivious elderly man reading a newspaper on a park bench, pretending to fight on a traffic island in a busy London interchange, smoking, drinking tea and playing a piano in a theatre hall, in various stages of undress in the East End docks, and in the relative sanctuary of McCartney's north London home. A number of the Mad Day Out images have since become iconic Beatles imagery. McCullin's pictures adorned the covers of McCartney's biography Many Years From Now and the first edition of Ian MacDonald's Revolution In The Head, as well as the gatefold cover of the Red and Blue albums, and in numerous other publications. McCullin was the main photographer of the day, and chose the settings while mostly giving The Beatles free rein to choose their own poses. The reason for this, he explains in the book's introduction, was because his normal working methods were quite different from The Beatles' requirements. They may have been disappointed with me. I had no words of wisdom. The day was a hit-and-run accident. They just threw themselves into situations. They completely opened themselves. They gave me every opportunity, and then they took over. A little more than a year after the Mad Day Out, The Beatles had all but ceased to exist as a group. The painful experience of recording Let It Be, the business wranglings at Apple, and John Lennon's increasing independence all helped in their demise as a unit. However, even in the summer of 1968 relations were not always harmonious. Less than a month after the Mad Day Out, Ringo Starr temporarily quit The Beatles, unhappy at the difficult studio atmosphere while recording the White Album. None of this is apparent in Don McCullin's photographs, however. A Day In The Life Of The Beatles captures the group as a close unit, laughing and joking, striking hammy poses for the cameras. They are shown laughing, dancing, dressed in a variety of costumes, and with props including diving goggles, brightly-coloured capes, a real-life parrot, and McCartney's sheepdog Martha. In one particularly poignant shot, Lennon is pictured playing dead while the others look over him. In another he is pictured with Yoko Ono and Ringo Starr, the three of them joking together. We must be thankful that these moments were documented. A Day In The Life Of The Beatles may focus on just one date in a momentous era, but the personalities that shine through in these pages will be how many choose to remember The Beatles. Don McCullin's beautiful photographs show The Beatles, for one of the final times, as friends, a truly united force, and as a band of brothers who summed up the spirit of the age. I have the book of the mad day out photo shoots and would advise any Beatles fans out there to get a copy ASAP .it is one of the most atmospheric and nostalgic collection of Beatle images ever published.believe me you’ll return to it time and time again.